What are the advantages of an ELISA test? One of the greatest advantages of ELISA tests is the ability to obtain quick and accurate results. All that is normally required is a simple blood sample that is obtained either through the arm or fingertip of a patient. The fact that an ELISA kit can test not only for antibodies, but antigens as well, makes it a versatile tool for physicians, laboratories, and medical professionals all over the world.The ELISA tests have also found applications in the food industry in detecting food allergens, such as milk, peanuts, walnuts, almonds, and eggs. ELISA tests can also be used in toxicology as a screen for certain classes of drugs. Another advantage of using ELISA test kits is their high sensitivity. ELISA Tests are favored over other testing options because not only are they more sensitive, but they are more cost effective. Even more striking, is the applicability of the ELISA tests as convenient and easy-to-use HIV ELISA testing devices. Because ELISA tests can be performed to evaluate either the presence of antigen or the presence of antibody in a sample, it is a useful tool for determining serum antibody concentrations, such as with HIV ELISA tests. The HIV ELISA test is usually the first one used to detect infection with HIV virus. If antibodies to the HIV virus are present, or positive, the test is usually repeated to confirm the diagnosis. If the ELISA test is negative, other tests are not usually needed. The ELISA test generally has a low chance of having a false result after the first few weeks of HIV infection. The specificity and high sensitivity of the HIV ELISA Test make it a widely acceptable kind of ELISA test since it is able to detect all the possible HIV infections. The HIV ELISA Test was the first screening test widely used for the HIV virus because of its high sensitivity. Use of the HIV ELISA test kit, in relation to HIV virus detection, can be intended both for screening of blood donors or as an aid for the diagnosis of clinical conditions related to infection with HIV virus. 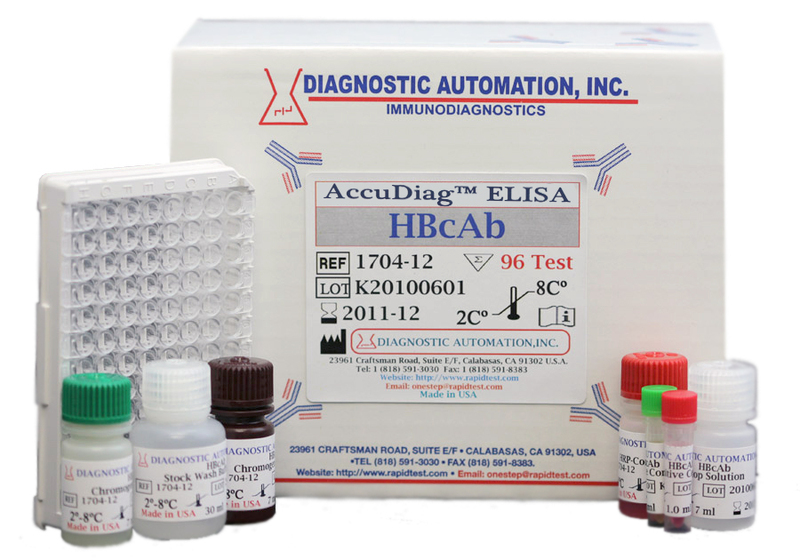 Diagnostic Automation/Cortez Diagnostics, Inc. has, as part of its superior ELISA test kit product inventory, numerous Hepatitis C ELISA Test Kits, or HCV ELISA Test Kits and Hepatitis B ELISA Test Kits, or HBV ELISA Test kits. Simple to use Hepatitis C ELISA test kits include the HCV ab ELISA test which detects IgG antibodies to Hepatitis C virus in human serum or plasma. The other convenient Hepatitis C ELISA test is the HCV ELISA Kit for quantitative detection of IgM class antibodies to Hepatitis C virus. Also available are Hepatitis C Rapid Test Kits. Superior and inexpensive Hepatitis B ELISA Kits are distributed within several ELISA Kit product categories: HbeAb ELISA Test Kit, HbeAg ELISA Test Kit, HbcAb Igm ELISA Test Kit, HbsAb ELISA Test Kit, and the HBsAg ELISA Test Kit. All of these highly effective Hepatitis B ELISA Test Kits are available in any quantity worldwide. Also in inventory and ready to ship, are top quality Hepatitis B Rapid Tests. Other Hepatitis ELISA Tests Kits include: HTLV ELISA test kit, HAV IgG ELISA test kit, HGV ELISA Test Kit, HEV ELISA Test Kit, HDV ELISA Test Kit, and HAV ELISA Test Kit. Again, various simple and highly effective Hepatitis Rapid Tests are available worldwide. Los Angeles-based Diagnostic Automation/Cortez Diagnostics, Inc. has established the gold standard in its superior product line of ELISA Test Kits and HIV ELISA Tests. 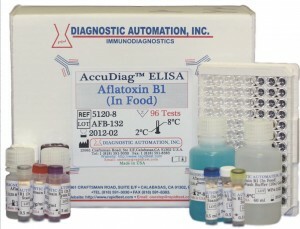 A wide range of easy-to-use and inexpensive ELISA Test Kits are available: Food Allergen ELISA Kits,Autoimmune ELISA Test Kits, Blood Bank ELISA kits, Cancer ELISA Test kits, Parasitology ELISA Kits, Steroid ELISA test kits, Thyroid ELISA test kits, Veterinary ELISA test kits, and Infectious Disease ELISA Kits, including Hepatitis ELISA Kits, HCV ELISA Kits, and HIV ELISA Test Kits. For more information about these ELISA Test Kits, or other products such as Rapid Tests, IFA Tests, CIA Tests, Serology Tests, or any Drug Test Kits, please contact our Customer Service Department. Diagnostic Automation/Cortez Diagnostics, Inc., a leading manufacturer and distributor of Drug Tests, Rapid Tests, and ELISA Tests worldwide, is pleased to offer inexpensive and easy-to-use HCV Rapid Tests – Hepatitis C Rapid Tests for distribution throughout the world. * The HCV Rapid Tests are designed for the special needs of any health organization that is looking for accurate, safe, and cost effective testing methods to detect Hepatitis C infections. Users are well aware that Hepatitis C virus (HCV) is now known to be the major cause of parenterally transmitted non-A and non-B hepatitis. HCV antibodies are found in over 80% of patients with well documented non-A and non-B hepatitis. In a large percentage of HCV infections, transmission is by transfusion and other parental means such as sharing of needles, occupational exposure to blood, and hemodialysis. However, in close to half of Hepatitis C infections, the route of transmission is unknown. HCV establishes a chronic infection in 50 to 80 percent of cases. Because of the epidemic proportions of Hepatitis C infection, the demand worldwide for highly effective Hepatitis C testing methods has increased. Those health organizations most directly involved in fighting this infectious disease, know that the HCV Rapid Tests are safe, quick, and some of the most effective means of detecting antibodies to hepatitis C virus. Our inventory of top quality HCV Rapid Tests includes five distinct tests for detection of hepatitis C antibodies. Three of these tests are convenient and user-friendly HCV Rapid Test Strips. The other two are in cassette formats. All HCV Rapid Tests are available worldwide, with the exception of the United States. This HCV Rapid Test – OneStep HCV RapiCard Insta Test -cassette style is a rapid, direct binding test for the visual detection of hepatitis C antibodies (anti-HCV) in serum or plasma. HCV Rapid test is used as an aid in the diagnosis of hepatitis C infection and is based on the principle of double antigen sandwich immunoassay for determination of anti-HCV in serum or plasma. Purified recombinant antigens are employed to identify anti-HCV specifically. This HCV Rapid Test is very sensitive and only takes 10-20 minutes for the results to be read. In preparation for the test, separate serum or plasma from blood as soon as possible to avoid hemolysis. Use only clear, non-hemolyzed specimens. If the specimen on the cannot be tested on the day of collection, store the specimen in a refrigerator or freezer. Stir and bring the specimen to room temperature before testing. The results are read visually without an instrument – wait 10-20 minutes and then read result. A negative result will show only one colored band on the control C region and no apparent band on the test (T) region. A positive result will show a pink-colored control C band and a distinct pink-colored band in the test (T) region. This HCV Rapid Test is for in-vitro diagnostic use only. Customers who inquire about these HCV Rapid Tests* have also shown interest in our HCV ELISA Test kits. * One test is the HCV ELISA Test – Ab which is an enzyme-linked Immunosorbent assay for qualitative detection of IgG antibodies to Hepatitis C viruses in human serum or plasma. This test is intended for screening and diagnosing patients related to hepatitis C infection. The other convenient and inexpensive HCV ELISA Test is the HCV IgM ELISA test which is an enzyme-linked immunosorbent assay for qualitative detection of IgM-class antibodies to hepatitis C virus in human serum or plasma. This HCV ELISA Test – IgM is intended for clinical diagnosis, management, and follow-up of patients related to hepatitis C infection. Please contact our Customer Service Department for more information about these HCV Rapid Tests or HCV ELISA Test kits at 818-591-3030. Los Angeles-based Diagnostic Automation/Cortez Diagnostics, Inc. has established the gold standard in its superior line of Rapid Tests. For example, a wide range of easy-to-use and inexpensive Rapid Tests are available: Hepatitis Rapid Tests, Infectious Disease Rapid Tests, HIV Rapid Tests**, Cancer Rapid Tests, Fertility Rapid Tests, Pregnancy Rapid Tests, Allergy Rapid Tests, and numerous Drug Tests such as Cocaine drug test, Marijuana drug test, K2 Spice drug test, and Drug and Alcohol Rapid Tests. Along with this line of Rapid Tests, are a wide range of : ELISA Test products: HIV ELISA Test kits**, Hepatitis ELISA Tests, Infectious Disease ELISA tests, Allergy ELISA tests,Autoimmune Disease ELISA tests, Blood bank ELISA tests, Cancer ELISA tests, Diabetes ELISA Tests, Food ELISA tests, Parasitology ELISA test, and Veterinary ELISA test kits. Check our online catalog for any of these Rapid Tests or ELISA Tests and at the same time examine the list of other medical testing products and equipment: IFA Test Kits, CLIA Test Kits, Serology Tests, and superior medical testing Instrumentation, including ELISA Readers and Washers. For more information on any medical testing products, please contact our Customer Service Department at 818-591-3030. * HCV Rapid Tests and HCV ELISA Tests are sold worldwide, with the exception of the United States. ** HIV Rapid Tests and HIV ELISA Tests – check with our Customer Service Department regarding distribution restrictions.